The best time to dive Indonesia is the dry season between between May and September, although you can dive there all year round. The water temperature is usually around 26-27 oC. It can be cooler in the Lembeh Strait owing to upwellings. Visibility is consistently good in the dry season. Indonesia Liveaboards - Compare prices online. Book now & pay later. An excellent film about the marine life of Indonesia, in particular the Lembeh Strait, has been produced by Nick Hope of Bubble Vision. You can watch it below - thanks Nick for sharing it here. For the dive sites of Bali click here. For elsewhere in Indonesia read on. See also our guide to things you need to know before your trip to Indonesia: visas, currency, tipping, etc. The islands of Indonesia arose from beneath the waves as a result of tectonic activity in the Earth's crust. The western islands appeared before those in the east. Indonesia has suffered two earthquakes recently, one in Lombok and one in Sulawesi. Lombok is getting back to normal and the dive operators have reopened. The earthquake in Sulawesi is hundreds of miles away from the popular Sulawesi diving resorts of Manado, Bunaken, Lembeh and Wakatobi and the diving here, and around the rest of Indonesia is unaffected. If you would like to donate to the Indonesia Earthquake appeal the Red Cross, Oxfam and other charities have all launched campaigns..
Komodo island is part of the Komodo National Park, a UNESCO World Heritage Site. The komodo dragon, the world's largest lizard, takes its name from and lives on the island. For sharks, manta rays, eagle rays and loads of life with wild currents head for the north-east of Komodo. Notable marine mammals include the blue whale and sperm whale, which you occasionally see, as well as 10 species of dolphin and dugong. Marine reptiles include five species of turtle. 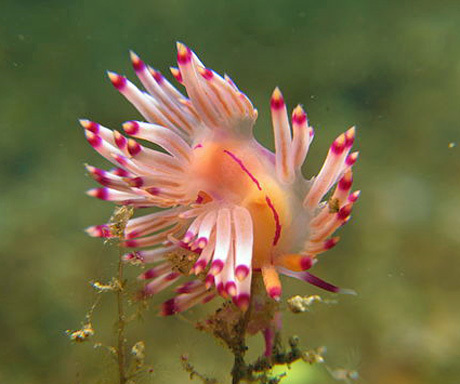 The southwest has cooler waters and but is ideal to spot the smaller creatures with loads of nudibranchs and the like. You can dive Komodo year-round but the best time to dive the north of Komodo - which is the most popular diving area - is in October. The conditions in July are good but that is high season with lots of divers in the water. The manta rays come with the currents around full and new moon. The water is warm with temperatures of 27 to 29 oC. The Northwest monsoon arrives between December and March when strong winds and rain rush in from the northwest. Temperatures in the north drop but are still a warm 25 oC. At this time the dive sites of the south are calm. Talking of currents, there are some wild ones around Komodo. To dive some of the best sites you need to be an experienced diver and confident in fast moving water. Always carry a delayed smb (safety sausage). Komodo is a protected area and you cannot stay on Komodo itself. Instead take a liveaboard (we recommend the Duyung Baru) or base yourself in Labuan Bajo in Flores. An island with some strong currents. Currents permitting, you can swim right round the walls of Batu Bolong. There are some massive shoals of fish - extremely beautiful. Bigger fish include Black Giant Trevally and Giant Sweetlips. Many of the fish you see in Komodo you will have seen elsewhere, but they grow much bigger here in this marine reserve. This is a world-class dive. When the currents are too strong to dive much of Batu Bolong, you will still be able to dive the North side which is in the Lee. Be careful though. I have never before seen a diver's bubbles going downwards but the down current at one end of the north wall was so strong it did just that. This was at the east where large pinnacles sit away from the main wall. The southern side is covered in hard corals. This dive is covered is encrusted in life with sharks and Napoleon fish hanging around nearby. 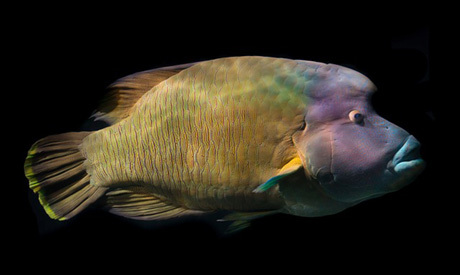 Napoleon wrasse, Cheilinus undulatus. Grows to 2 m long and 190 kg in weight. Lives for over 30 years. Batu Bolong is a famous site and can get crowded. If too many boats are there you can always divert to Tatawa Kecil which is also a splendid dive but not as well known. "Vertical cone rising from the deep covered in coral with crystal clear waters and both big and little life covering it "
"Like an aquarium, make sure you jump in to the chimney which is on the left hand side of the dive site. Currents are strong but loads of GT, sharks and reef fish make this my favourite dive site! " "Intense and gnarly. Up and down currents and whirlpools result in a wall that has a lot of everything from that region. " "Awesome! The current is unbelievable. !" Near to Batu Bolong, Tatawa Kecil is a small rocky island. Drop down to a small cave which as it is open at both ends you can swim through. Outside the cave look for sharks - White Tip Reef sharks are often around. Large boulders are scattered on the seafloor at 14-26 m. You will also probably see a Hawksbill turtle. A very curious porcupine fish may come up to inspect you. Huge shoals of fish. Later in the day the reef gets very noisy - a good sign of healthiness. Not only does the dive feature sharks, turtles, massses of fish and lovely reef, it often finishes with a great drift with the current. A lovely dive. Another dive site with strong currents. Swim through a split to the corner where you will probably need to hook into the reef to watch the sharks at around 28 m. White tip reef sharks abound plus masses of other fish. Once you've finished watching the sharks carry on around the pinnacle. Big painted spiny lobsters live here under ledges. You may need to hook into a shallow part of the reef for you safety stop. Look up to see what might be passing, eagle rays are often seen here. Crystal Boomi means Crystal Rock. This dive is best with some current - you get better vis and more fish. There are very pretty coral bommies with brown glass fish, seafans and table coral. From here go out to shallow outcrops on white sand. Here, near full moon, you might see spawning damselfish. The fish quiver, changing colour from light to dark to light. Look for pretty Cirrhitihchthys hawkfish in the green tube coral. The Cauldren itself is around 30 m across and 27 m at its deepest point. You will sometimes see manta rays here. "Extremely fast drift dive, manta rays, sharks, turtles, very strong current. " Quickly drift down the passage then you can hook into the reef in the current to see huge shoals of fish plus maybe white tip reef shark and tuna. You then speed along the shallow reef flats on a wild drift. This dive has a terrible profile but is fantastic fun. After the plateau go down over the edge - you may see a turtle in the rocks there. At dusk there also sometimes lurks an absolutely enormous grouper. How much do I love this dive. Minimal swimming - just stay still and watch the fish. Drop off the boat with a negative entry and descend, looking down for sharks. Cross up the reef slope of the castle and up into the giant shoals of fish. The sharks only get off the bottom when there is a current running but there are lots of them. Some have shoals of fusiliers swimming alongside - the shark's head pokes out at the front with the fusilier trailing back by its sides. As well as fusiliers there are schools of Elongate Surgeonfish - Acanthurus mata - some dark and some light in colour. Giant trevallies, schooling bannerfish plus the possibility of an eagle ray and grey sharks. The top of the rock is at just 5 m.
"Underwater sea mountains, surrounded with grey reef sharks, strong current "
"Just insane! Sharks literally EVERYWHERE! We dropped down to 28 meters and there were a pack of hunting Grey Sharks, amazing and they are huge! There is a bowl at 5 m where we did our safety stop as the current whirled around us - it was the perfect shelter and end to a perfect dive. My favourite so far. " "Amazing high-energy dive in strong current with abundant large fish in full activity. Advanced dive site not for the beginner when the current is running." "Unbelievable dive with fish everywhere, sharks, turtles, dolphins, and the possibility anything could show up." "Current central. A rock castle under the water, and the challenging swim around it is half the fun. A lot of unspoiled everything from the region. " "Thousands of fish, including 3 shark species and dolphins all in one dive." You can only really dive the Lighthouse without current. If there is a current you are limited to the lee of one rock. Look out for whitetip reef sharks and manta rays. This is a large area with wide channels running down a rubbly bottom. Quite shallow - maximum depth of around 30 m but you will normally be shallower than this. Here is the place to see mantas but there are also nudibranchs and a massive turtle. Black tip reef sharks also visit. The reef mantas here are the same ones as those on Manta Point at Nusa Penida in Bali - they have distinctive markings. When looking for mantas don't hover over the small coral outcrops as some of these are their cleaning stations. Mantas are curious and if you stay fairly still they may well come over to have a look at you. "Incredible - we saw Manta Rays! The dive site is shallow, at 15 m maximum depth. So much macro to see too! Nudibranches, Octopus and Mantis Shrimp were spotted as we made our way to the Manta cleaning station. The guides say that they see Manta's all year round on this dive site. " "Diving around Komodo 'Hot Rocks' striking colourful corals against black sand with nudibranchs and pygmy sea horses, the sea bed bubbling because of an active volcano - beautiful. " This dive site is jsut 15 minutes boat ride from Labuan Bajo in Flores. This is not a dramatic dive but look out for interesting nudibranchs such as Chelyonotus semperi, and many many blue Redtooth Triggerfish in holes in the reef. 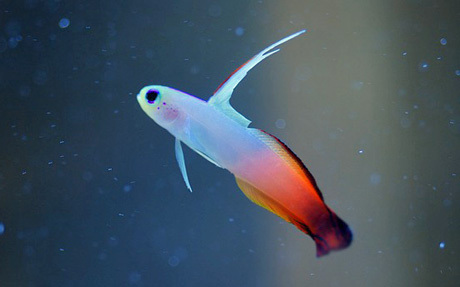 Also lovely to see are the Fire Dartfish. Good as a test dive to get used to the "safety sausage" needed at lots of sites. Depth 30 m.
"One of the best in Komodo, fantastic coral with no single broken, Current is dangerous." Named after the many torpedo rays which live here. A good macro dive, different to most dives in Komodo. The black sand gives a good contrasting background for photographers. Sea pens, tiny crabs, nudibranchs, cuttlefish, corals. Frogfish gdand harlequin ghost pipefish amongst the rocks. Normally only a gentle current. "This was only the second time this site had ever been dived. At the mouth of a long bay, the currents meant it could only be dived at slack tide. Even then it was a quick and vigorous descent to the shelter of a rock outcrop c. 30 feet down. Then there was no need to move anywhere: just hang out at 30 metres and watch the show: several grey reef sharks circling below, half-a dozen six-foot dogtooth tuna flashing through the clouds of fish above (which were so thick it was difficult to see the surface despite the 40 metre vis). Around 8 huge giant maori wrasse, biggest any of us had ever seen, lurking around too. School of huge yellowfin barracuda, horse-eye trevally circling us...wow! And above surface was almost as beautiful and fascinating as below. Lots of cetaceans sighted to and from dive sites, even allowing us to snorkel close to them (mixed pilot whale and dolphin schools), crystal clear water and sparkling white beaches, sheer drop-offs and pristine coral. Definitely overall the best place I have ever dived (which includes Gt barrier Reef, Maldives, Thailand, Saba, Dominica, and several others). " " Sea mount, big fish, current. Amazing marine life, clear water. " "The most beautiful wall I've ever seen, completely covered with layers of colourful life. Coral and sponges on every square centimetre, full of fishes of all kind, lots of macro life. The visibility is a perfect 30+ metres." "Don't miss this one! The best wall I have ever dived. Current, clear water, sunfish, swimthrough." "Drift dive, deep wall(40m+ at the top of wall). Eagle rays, mantas, sunfish." Recently found dive heaven in remote place. From macro to pelagic, from seahorses to whale shark all have been seen." Full of big eye trevallies, dogtooth tuna 2 meters, turtles, sometimes whale shark, and baracudas school, and groupers too"
Full of baracudas and chevron baracudas 1 meter long, and yellow snapper, and nice strip of perfectly healthy reef. Eagle rays and shark is common encounter"
"A pristine wall with tricky currents. 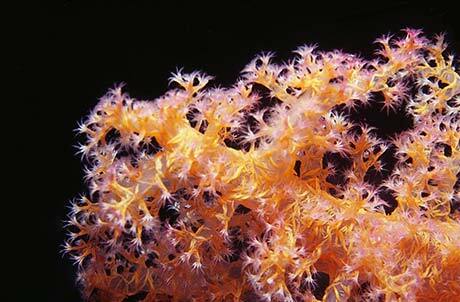 Many pigmy seahorses on a red gorgonian and a forest of amazing corals. 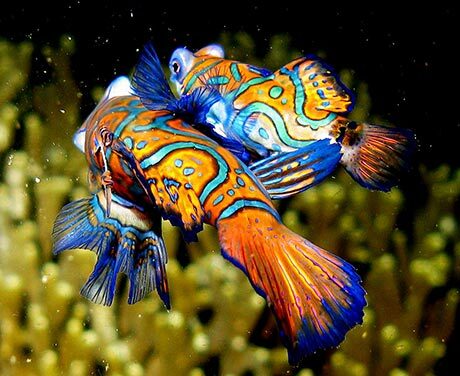 Reef fish life is outstanding. " "Just perfect for relaxed drift diving with the best macro life around" "
"Batu kapal located at Nain Island arround Bunaken national park. Big rocks at 40m depth, great Hammerhead shark, good for deep dive , have cave around 60m out 78m, my top dive! " "Bunaken has lots and colourful corals, and some of them can never found anywhere else. I heardsome of the are thousands years old "
"Wall dives out of this world. Simply the best. Everything from big sharks to critters. Bunaken is divers heaven as the reef is in mint condition and you see almost everything there is in marine life. " "A definite highlight of diving in Indonesia is Bunaken-Manado Tua Marine Park, a marine reserve of over 75000 hectares only a few km offshore from Manado. Beside the tiny island of Manado, hte reserve encompasses Bunaken, Manado Tua, Montehage and Nain. Each island is surrounded by a dense coral reef which makes the naming of individual sites almost pointless. Diving in Bunaken area is without exception wall diving on sheer vertical coral walls with phenomenal growth well into the depths." Jack Jackson in his book Top Dives of the World. "Can dive all 3 types of coral reef. Still a secret in dive world, so discover them for yourself. Amazing diving in breathtaking scenery. A must! " "Underwater volcano located about 500m from the Mahangetang Island, pinnacles , sea mountain, hammerhead, scolling jacks, baraccuda. Viz-- clear water up to 40m." "Bangka Lagoon on Banka Island just north of Sulawesi and the well known dive areas of Lembeh and Bunaken. Over the past 15 years I have dived many well known sites and I was in search of some thing different, unique-non touristic for my vacation to Manado-Nth Sulawesi. Bangka is a hidden jewel with every dive an even greater surprise. Can strongly recommend Bangka and Banka Lagoon for your next dive location." "Pinaccles with caves, sharks, rays, current, macro off Bangka Is. 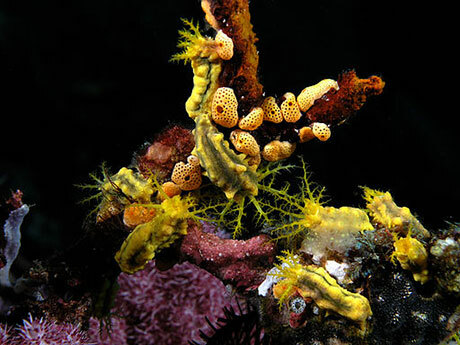 Sulawesi "
Famous for its many small creatures: nudibranchs, frog fish, seahorses, mimic octopuses. See Nick Hope's video above for a taste of the excellent diving to be found here. "A trip where you can see a pygmy seahorse is always great. A place where in a dive you can see 3 from 2 different species is priceless. Just coming back from Lembeh Strait where not only I had the chance to experience that but also dive 7 days looking at the mud to see all those small critters we learned to love from the photos (as to see them with naked eyes is almost impossible)." "Murk dive with the weirdest creatures you can find"
"Lembeh Strait is critter madness; nowhere else one will find this incredible variety of critters "
South east of the Sulawesi itself. A national park, fishing is restricted and the reefs protected. The best time to go is between March and November. July and August is the coral spawning season, visibility might not be as good at this time but the spawning attracts loads of fish. Pilot whales may visit from November to April. The water is always warm. The rainy season comes in January and February. But Wakatobi has less rainfall than in other parts of Indonesia. West Papua was originally called Irian Jaya. West Papua is the Western half of the island of New Guinea (Papua New Guinea being the Eastern half). The famous Raja Ampat islands are off the north west of West Papua. "One of the few places left untouched on this planet - a real gem. The corals are in an immaculate condition. I really had a fantastic experience of mantas, whales, dolphins and amazing sea life. The accomodations are basic but very nice and very clean. Great area for under water photographers as well. Max, from Irian Diving, has been a wreck diver and an explorer of the sea in West Papua for 10 years: he knows all the whereabouts of the fish life and wrecks. He has an amazing knowledge of all sea creature and at 28 to 40 metres can show you Pygmy seahorses! A wonderful character full of adventures and a great story teller." "It's incredible here because we can play with whale sharks all the season. " "2 km long, straight down 30 m wall. Very pristine and colourful sea life." Raja Ampat is renowned for its remote diving. The name means four kings for the four major islands that make up Raja Ampat - Batanta, Misool, Salawati and Waigeo. To get there you need to take, for example, an internal flight to Sorong and then another flight to Waisai. From Waisai you take a boat to your destination - arrange this before you go. Raja Ampat is for keen divers - there aren't many other activities you can do there. The resorts are minimalist and constructed with regard to the environment. Seventy-five percent of the world's corals are found around Raja Ampat. Raja Ampat Liveaboards - Compare prices online. Book now & pay later. "Best ever place for divers"
"Mantas and pygmy seahorses and everything in between. I spent 10 days on a liveaboard in 2004 and loved every minute." "There's a virgin dive spot in west papua Indonesia. Very few people know where Raja Ampat is." "Holds 75% corals and species varieties ever found in the world"
"Manta cleaning station. 60 minute dive surrounded by 14 mantas (3 full blacks)." "Amazing dives with whales, manta ray, sea snakes, corals in pristine conditions, millions of fishes, dolphins a gogo and amazing sea horses and wrecks. A MUST. " This dive site is said to have the greatest number of fish species ever seen on a single dive - 374! "Cape Kri, located on the tip of Kri Island is the Divesite with the largest number of species referenced in one single dive! The up, down and side way currents make it a a dive for experienced divers, but also have created an incredible variety of fauna and flora � all kinds of sharks, many shoals of fish, amazing coral diversity, nudis�everything is there! Besides Blue magic definitely the best Divesite in the best diving area of the world! " "Wild dive site with strong currents and the most bio diversity you�ll find anywhere "
"Just the most beautiful coral reef and the most well preserved and FULL of life. Just amazing. " "Large coral reef plateau with sharks, mantas, a Queensland grouper, barracudas, trevellies, dolphins. " 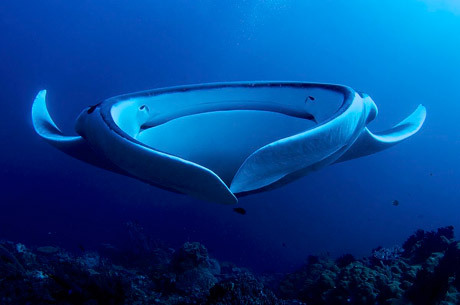 "Amazing dive site where you can dive with large Manta rays and schools of fish. Shallowest depth on the reef is approx 6 m. Up close and personal with the amazing, gentle Manta rays. Located in Raja Ampat. " "Magic Mountain is a mount with 2 manta cleaning stations, strong currents, lots of sharks, wobeggongs, octopus, walking shark, frog fish." "Has strong currents, swim through, wonderful corals, pygmy seahorses, lots of pelagics"
"The best dive spot in Raja Ampat is Blue Magic. It�s really a magic spot! You can see many big school of fish. Manta Rays, barracuda dan beautiful corals! That�s heaven. " "Platoons of fishes, more than a thousand on a sea mount. Nowhere else in the world"
The Gili Islands are three very small islands northwest of Lombok. Trawangan is the busiest with many bars and restaurants. At the smallest island, Gili Meno, you can see turtles at Turtle Point. The third island is called Gili Air. This is the least developed but does have a cash machine. "Clear and calm. Huge amount of wildlife everywhere you look. Schools of fish are swimming around you. "Sharkpoint has canyons and reefs with a lot of big fish." "Hans reef is a big pinnacle. Very nice, we saw frogfish, pipefish, white tip reef sharks, turtles, batfish etc"
"20-30m deep, canyons of large rocks with massive coral creation, lots of whote tip reef sharks, stingrays and large sea turtles. Amazing visibility despite rain and depth "
"This extensive reef north of Sekotong is a popular site for our morning dives. The reef is about 3km long with sidetracks coming off right and left. The top starts at 18m and you will find the sandy bottom at about 32m. The variety of species is huge. You can find Jacks, Trevallies, Whitetip Reef Sharks, different Rays incl. Mantas and much more.."
"This reef is in the Northwest, and a dive site for exploration. Surrounded by Shrimp, ghost pipefish, and glassfish, this site divides itself into three main routes. Bluespotted rays, Cuttlefish, Morayeels and a lot more await you. 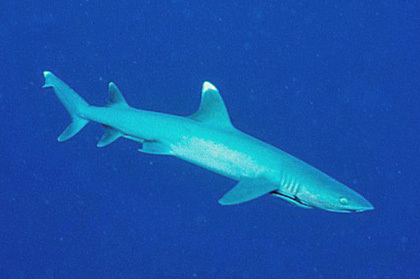 You may even see a Whitetip Reef Shark." "This is a small rocky island on the south side of Rote island with Beautiful untouched coral mainly soft coral and some hard coral. Lots of reef fish and sometimes in the season we have manta rays and whale sharks here." "Diving with mantas, the area around the island is relatively shallow, with wide sandy flats, coral bommies. there are many manta cleaning stations, and we were able many times to get very close to a resting thresher shark. In 15 dives, we saw mantas every time.!" "Pulau Moyo is not a very famous destination as it is hard to get there, but what a place!!! Over 60 meters of visibility and tons of BIG FISH!!!" "With unique coral and lot of fish in deep blue ocean, one spot at Sumbawa ocean is a great place to dive." "Awesome! Set of three large bommies on the edge of an infinate drop off that falls away from 50 metres, over 100metres visability. Manta rays and huge schools of Trevally. !" The seeds of this dive trip started in the summer of 2005, when we met Shaun and Beth Tierney of SeaFocus. We were passengers on a live aboard in Belize and they were working on their latest book Diving The World. The four of us clicked and in the late fall of "06" we got an email asking us if we would like to join them in Indonesia. The ship was the Archipelago Adventure II that travels the Banda Sea and the Spice Islands. It took us about 20 seconds to say "yes". We all met in Bali and our flights had been arranged to Ambon. Four hours later, the group boarded large aluminum tenders in Ambon harbor for the five minutes shuttle over to the Archipelago Adventure II. We had a brief introduction and then were escorted to our rooms where our luggage was waiting. Our room was on the upper deck and had a huge picture window with twin beds in the most spacious live aboard room we had ever had. The shower was large enough for two, and the AC was controllable. There was more than enough space to spread out with extra drawers under the bed and with a power strip (110 and 220) on the desk area; it was easy to recharge my camera batteries in the room. The ship is a wooden ship created for divers 2 years ago in the traditional Indonesian sailing ship fashion. The top deck is for sunning (no shade) with padded chaise lounges, with the feeling of an 18th century sailing ship, including the skull and crossbones flag. One deck down is the dinning room and meeting area, 4 of the 10 cabins and the pilot house. The next deck down are the other 6 cabins, dive decks (10 spots on each side of the ship) and the TV room with camera / photo outlets and drying tables. The bottom deck is for the kitchen and crew. A dumbwaiter is used to get the food to you fast and hot. Because of the design of the ship, in rough seas it does rock and creak with wooden noises. If you are prone to sea sickness, get medication or try another ship. The Indonesians are world renown for their service with a smile and this ship was no exception. Any need or want was dealt with a genuine smile. Example: Just as I was to make a dive, the left lens of my glasses came out of the frame screw and all. By the time I returned to the ship to deal with this problem, I was handed my repaired glasses along with the original screw that was found on the dive deck. Anything needed was taken care of. The food was very good and plentiful. 4 meals per day. The breakfasts were a little weak, with eggs every day. We had a great assortment of drinks that you monitored yourself on the honour system. Australian wine or beer were available with dinner. The rooms were cleaned and fresh towels each day, along with a warm diving towel as you came out of the water. The corals on the walls were beyond description. Colors and size like nothing we have ever seen. The underwater topography was breath-taking. It was obvious that the volcanos had been active with huge boulders and black sands in certain areas near Ambon. Although muck diving was new to us, we quickly caught on and were spotting Mandarinfish (mating) pipefish, moray eels, robber crabs, seahorses, and even the allusive flambouyant cuddle fish. The night dives were a whole additional story. More critters than could be written on an underwater slate. Lobsters, eels, crabs, shrimps, cocooned parrot fish, sea snakes. you name it and it was there. The fish life both large and small was inconceivable. We saw more fish on the first check out dive than we did a whole week in the Bahamas one year earlier. Butterflyfish, angelfish, jacks, (better know on this ship as Yaks) needlefish, barracudas, tarpons, grunts, snappers, groupers, wrasses. Pipefish, trumpet fish, puffers, burrfish, rays..how about a Rhinopias eschmeyeri (a special hard-to-find Scorpionfish). If it lives in this part of the ocean, we saw it! We saw sharks, blacktips, whitetips and even an Indonesian version of a Manatee. Whitetip reef shark, Triaenodon obesus, Photo credit: Tim Nicholson. When asked what the most exciting part of the trip was and what I will always remember, I would have to say that on one dive in the muck of Banda Neira, I was swimming along with our dive guide when he holds out his hand to stop me. He takes his pointer and slowly and carefully digs it a few inches into the sand. All of the sudden out of nowhere, this huge eel snake leaps out of the sand that has him completely covered, flies two feet up into the water, and within five seconds, has buried itself tail first back down into the mucky sand. It was a good thing our wetsuits were washed each dive. The dive operation was good. The guides were more than willing to point out critters that we might have missed: maybe even a bit over enthusiastic. One tender on each side of the ship was loaded with photographic divers and one tender with non-photographers on the other. Most of the dives everyone just did their own thing, following their own dive profiles. The briefings were short and direct. The dive deck was a little crowded when everyone was trying to get geared up, but it was manageable. The currents were ripping on 3 of the 37 dives we did. This was the first time we had ever used dive hooks during dives, although some divers were able to adjust without hooks. We went ashore in two different locations during the twelve night trip. On the largest of the Banda Islands, we went to a nutmeg plantation and we learned all about the development of the Spice Islands. We learned about how at one time the spices were more valuable than gold and how thousands had died over the control of the islands. The second shore excursion was to the city of Ambon one of the poorest places on earth. It has suffered since the fighting occurred between Christian and Muslim in 1999, and most of the downtown port area has never been rebuilt. Twelve nights was just not enough. Each dive we saw something new and exciting. Usually after a dive trip, Patricia and I discuss if we would like to go back to the same place and our usual answer is "Yes,... but there are other places to see first." This time it was an unequivocal yes with no buts. A chapter is devoted to each of the following important regions in Indonesia for divers: Bali, Sulawesi, Nusa Teggara, Lombok, Komodo, Timor, Alor, Raja Ampat and West Papua. It also features helpful listings of where to stay, eat and drink and who to dive with. 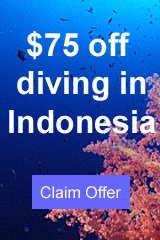 Have you dived in Indonesia? Let us know about the dive sites, accommodation, dive centre and anything else you feel like mentioning. Either fill in the form below or see our more detailed recommendations form.